I found a site that will generate a map of states you've been in. I gotta get to Vermont so I can at least get every state that is completely east of the Mississippi. I love looking at these fifty united States and visiting them and enjoying the unique characteristics and people and places each state has and this uniqueness and identity we have with the states we live in truly is what makes us united. ...was where my seat was in tonight's Flyers-Maple Leafs game at the W------- Center (no plugs for Banks on my blog); good seats, 13 rows back from the right-side goalie face-off circle. Flyers won 4-1 to break a losing streak. L----- did a promotion during the game in which our entire section won a free radio-controlled toy car. Instructions were to pick it up near section 120 after the game. However, many from our section went to pick up their prize during the 3rd period and by the time I got there, which was after the game, they were out. There were about 20 or so people upset with this and the security staff blamed L----- and I do too as they should have made sure they had enough for everybody; either that or they weren't scanning tickets or marking them off as people got the cars. The center staff eventually gave us a paper to fill out our name and address and said that they will give it to the sponsor's rep. and hopefully send us our prize. It's not the item but the principle so I put my name and address down. If they indeed pass the paper along, I'd guess there is about a 20% chance I get a toy car, 50% chance I get a gas card or something else that would likely make me buy something in order to get something or some discount, and 20% I get a letter from the company. I can't say I believe anyone will get the paper we filled out so I will probably email someone on the Flyers and complain. Otherwise, the game was fun. I hadn't been to a hockey game for a few years and almost forgot how fun the games are. Incidentally, it's $10.25 for a 16 oz Yuengling and a hot dog. Traffic getting into the Center was a mess. There must have been something at the Spectrum too. Overall, it was a fun night out. Yes, I know, Christmas is still a few days away and, in fact, it's not even winter yet. But, I've been saying 'Merry Christmas' to people and, amazingly, I haven't been beaten up, boycotted, or scolded on being intolerant. Maybe schools, businesses, and the news (it's Christmas shopping, not Holiday shopping) can try the same thing. What are they afraid of? To be fair, I've have seen places print or say the word Christmas. Home Depot, L.L. Bean, Kay Jewelers, and Giant food stores have all said it on a TV or radio ad or printed it in a sales flier or catalog. I am sure there are more but I know it's not the majority. Maybe there isn't a war on Christmas after all. It may be more of self-censorship by those who've been made to feel bad for who they are or where their roots are. I don't think non-Christians, at least in this country, really are waging a war on Christmas. So, that being said, enjoy your Christmas and, if you don't celebrate it, enjoy the federal holiday on December 25th, which happens to be called Christmas. Maybe it's not a religious holiday anymore, but it's still an American holiday, like it or not, and there is a reason why it is a holiday. We can practice any religion we choose. Schools and employers will allow us to take off from work or miss class in order to observe important days in our respective religion's calendars. All religions are tolerated in the U.S. but sometimes you wouldn't know it by how some entities go through great effort to avoid the term Christmas. Speaking of holidays, I wonder what would happen if someone started printing - "school closed - Civil Rights Leader Day" instead of "school closed - "Martin Luther King Day." Why not? We've neutralized holiday's before; like President's Day, officially neutralized (effectively putting Lincoln and Washington in with Carter and LBJ) and, unofficially, Christmas is being neutralized too, mostly by people with Christian roots. "School closed - Civil Rights Leader Day" won't fly but "school closed - Winter Break" glides with ease. 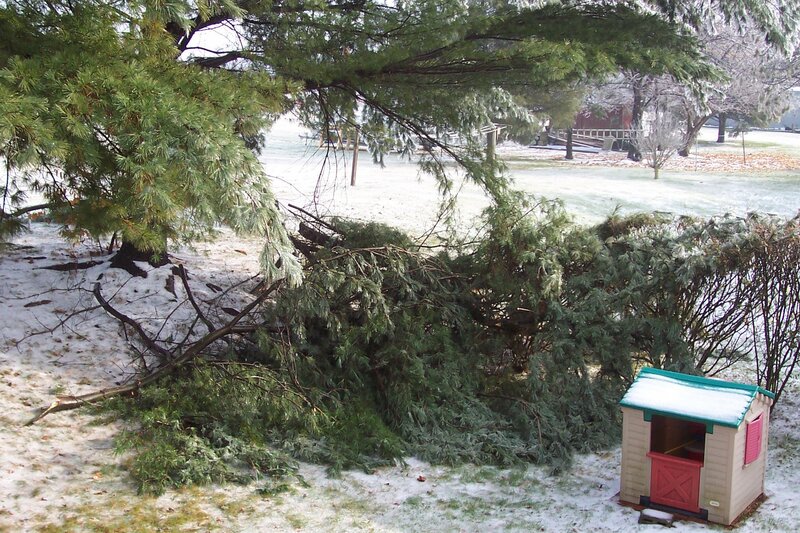 Thanks to Township Cooling and Icing, one of our pine trees lost a lot of weight last night. There are at least three major limbs there and maybe five to ten smaller ones; not counting sticks and minor branches. I haven't counted officially yet as I didn't want to spend too much time under the tree as there also appears (not in the picture) to be a few broken limbs high above that have yet to fall. For perspective, that Little Tykes house measures exactly 48" at the peak. Luckily, nothing other than our neighbor's hedge was damaged. That tree usually loses a few limbs over the winter but this was by far the worst. I can't move these limbs myself. I will probably lasso them and pull them out with my truck. As for disposal, got me. It would take me all day with a chainsaw, at least. The weather is the news locally. Predictions of snow and sleet today have stirred everyone into a panic. Schools are already closed and yet not a drop of precipitation has fallen yet. In other (non) news, another tropical storm season has passed with little fanfare and no major storms hitting the US. I am sure Al Gore is upset about this, as he is abroad again blaming the US for things we can't control. After another year of dire predictions, the eastern tropical storm season was, fortunately, another dud. I recently caught parts of the Weather Channel's 100 Greatest Weather Moments and I take issue with a few rankings. First, they rank Global Warming as number one. Global Warming is climate and not weather and that's like saying the earth's 'climate' is the most significant weather event in history. Well, duh, thank you Mr. Obvious. Additionally, who's to say that in ten or twenty years the warming won't change back to cooling? Secondly, they put Hurricane Katrina at number two but the Johnstown Flood of 1889 at 40. The Johnstown Flood, and ensuing fires, destroyed the city and killed about 20% of the city's population. Katrina killed about 1500 which is terrible, but it could have been worse and it certainly wasn't 20% of the people in her path and it certainly did not destroy New Orleans; she was badly battered and bruised, yes, but not as badly as Johnstown was. Imagine if a flood and fires destroyed a US city today, no matter how small or large, and killed 20% of its residents? It would be a Blame Bush Fest like none that has ever been seen before! In fact, the pollution that would accompany the blame Bush parties would certainly be more damaging to the planet than any hurricane or flood could ever be. The hot air from Al Gore's mouth itself would raise the earth's temperature three degrees C.
As for the flood, some will blame the club members and their negligence for the dam burst but one must blame Mother Nature too. Just like we can blame man for failures in New Orleans, the weather still played a major role. One major difference, though, people were warned about Katrina days in advance. The people in Johnstown got no warning at all. I would move the Johnstown Flood of 1889 up closer to Katrina with both in the top ten; probably top five but not one and two. I don't think I would include Global Warming at all and that may well leave the weather predictions for early June of 1944 in the English Channel and French coast as the most important weather moment in history. I still like the Weather Channel and find it informative and useful but I think their 100 weather moments was slanted some. Hurricanes, floods, tornadoes, et al, are all Mother Nature's way of telling us we don't have the influence we think we have. 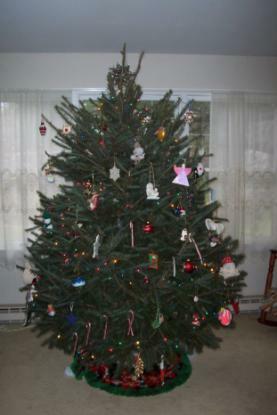 I relaxed my self-imposed fifteen-day rule (don't get the tree until at the earliest, the 10th) and took the family to choose and put up our tree yesterday. I think it looks good. 1. The Eagles losing to the Seahawks and pretty much eliminating themselves from playoff contention. 2. WVU falling flat (yippie!) to Pitt on Saturday. What an awesome game! That was Pitt's biggest win in years. Awesome! It's not as sweet as a win over ND or PSU but I'll take it. Since Joe refuses to play Pitt, WVU is the rivalry right now. 3. The doom and gloom forecast of snow, ice, and freezing rain for yesterday which, of course, turned out to be about half an inch of snow, no freezing rain, or ice. Maybe Township Warming neutralized the storm. I went to the store on Friday, like I always do, in the morning to beat the panic that would unfold in the afternoon. Saturday I realized I was low on rock salt and decided ride it out with the little bit I had because there was no way I was going to the store on the first of the month with a forecast of bad weather. It turns out, I only used a little salt on the front steps because, as I suspected, the storm was nothing more than a brief annoyance. I'll give them some credit though, they were right about the wind forecasts for today; gusts to 45mph they say and it sure is windy right now. 4. The economy? Wait, GDP rose 4.9% over the third quarter, beating estimates. Not only can't weathermen get it right, economists can't predict very well either and it seems they are (well at least the news is) rooting for a poor Christmas shopping season to boot. 5. Windows Vista? So that's the buzz. I haven't used it other than helping with some out of the box setups for a few people. Someone commented to me, referring to the look and feel of the desktop, that "it looks like the Mac." All I know is that I'm happy with Slackware. Slackware 12 with XFCE is much faster than any XP machine I've ever used. I would assume the same holds true when compared to Vista. Number one - oh well, there's always next year. Good to see number two happen. The hype in number three usually happens and number four is just wishing thinking of doom and gloom by the MSM. Number five - looks like Vista is turning out to be a bona fide dud. Yesterday I went to the Pitt game with two college friends and one of them had some all-access passes for Pitt games at Heinz Field. So, we spent most of the first half on the Pitt sideline. When you watch a football game you always see regular people on the sideline and yesterday I was one of those people. To say it was awesome is an understatement. At the half, we went to the club level which is heated and has a bar. Heinz field does not sell alchohol during Pitt games but on the club level they do. After spending some time there, we were able to get into a private box through my friend who knows some of the regulars in the box. In the box with us was Foge Fazio and Jamie Dixon amongst others who were probably also fairly prominent in the local sports or business scenes. Foge sat in front of us and we chatted often during the course of the second half. Coach Dixon was on the other side of the suite engaged in conversation but I was able to sneak in a quick "Coach Dixon, best of luck for another good season" and shake his hand. Coach Fazio is very personable and my friends and I had quite a pleasant time engaging in the normal chatter people engage in while watching a football game. I was never formally introduced to Foge and it wasn't until after the game I discovered it was him. The stadium only provides the box. The catering staff, which included a chef, and food are hired by the box's owner. The spread included crabcakes, coconut shrimp, ham, prime rib, and other fine foods. The drinks included the usual beer and soda, 12-15 bottles of the most popular types of liquor and some wine. My friend suggested I have a glass of wine and I declined but when he told me what it was, I changed my mind. I couldn't resist drinking a glass wine that costs $200 a bottle. There was more than one bottle of it on the bar too. I never thought I'd encounter, certainly not within an hour, a former Pitt football coach, the current basketball coach, and get within about four feet of Coach Wannstedt on the sideline. Actually, he got close to me as I wasn't about to intrude on the team's space but as the course of the game dictates, the head coach does have to traverse the sideline quite a bit. Pitt played well during the first half and led at halftime 14-10. Once we left the sideline and went upstairs, they fell apart. The final was 48-37 USF with USF getting two scores directly off interceptions and setting up a third with one too. Aside from the Pitt-PSU game in 1987 (Pitt won 10-0) yesterday's game was the most memorable but more for the extracurriculars. Some other notes: it's 287 miles from the Sheetz in Monroeville to my house. I got on turnpike in Monroeville at 5:05 and I was in my driveway at 9:45. I made two quick stops and went through the Wendy's drive-through in Carlisle. Certainly a fun experience and something I didn't expect as I didn't know I'd be able to use an all-access pass. I won't be able to sit in my regular seats again! Making a quick post today before I head out to the Pitt-USF game; it's COLD here in Pittsburgh: 24 F at 8:45 am and it will be in the 30's during the game. I am doing a quick turnaround; left for Pittsburgh yesterday and going back home after the game. To keep myself occupied, I loaded my MP3/Ogg player with a few Linux Link Techshow podcasts (Ogg, of course) and discovered a great new game to play while driving - spell out cities, towns, and other words you encounter in Morse Code. See the Carlisle exit, and just blurt out dash-dot-dash-dot dot-dash dot-dash-dot dot-dash-dot-dot dot-dot dot-dot-dot dot-dash-dot-dot dot. Really, it can be fun and it keeps your mind going. It's easier to say than to type. Over three inches of unpredicted snow fell over our area yesterday into today. 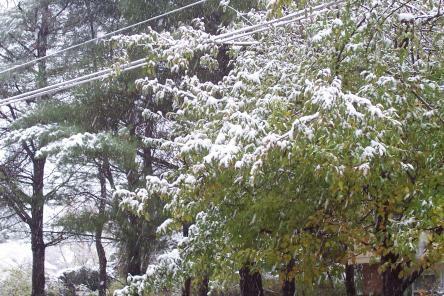 The forecast was for a rain and snow mix with little or no accumulation. It actually worked out well since it wasn't predicted, there was no pre-snow panic. As you can tell, my apple tree still has most of its leaves, which are much easier to deal with when they fall than the pine needles that cover about 50% of my yard and fall on the roof and completely fill the gutters. If you've never had the joy of raking and blowing pine needles and clearing gutters of them, you are missing out on one of life's great treats. Diamonds or pearls? What's up with that? Is that question indicative of the decisions a cabinet usually asks a president to make? Is that a matter of national importance? I did not watch the debate so I cannot comment on the content and the alleged pro-Clinton tilt. But I can say that questions about jewelry are silly and unlikely to be topics of discussion when Iran takes Americans hostage again, or when China moves some capital ships closer to Taiwan, or when Democrats are scratching their heads as the War on Poverty quagmire moves closer and closer to year 50 with no end in sight. Let's end this charade so that B.O., Joe Biden, and Denis Kucinichovich can get back to doing what they were elected to do - representing and working for their constituents. I mean, really, these guys should be in 1) Washington or 2) their state/district working for the people; not flying to Vegas and Iowa and Philadelphia, and everywhere else. As for Edwards, he can go back to suing big companies for doing mean things like making money. The MSM is rooting for Hillary and making no real effort to conceal it. So, boys, get back to work! If the economy is in such dire straits like you all say, you'd be doing everyone a favor by not accepting any more money from the waiting-in-the-soup-line public. Hillary's money only comes from straight-shooters like Norman Hsu or dishwashers in NYC who love her so much they have no problem shelling out $1000 for her campaign. I remember when I was making $6 an hour. I just couldn't wait to give some millionaire candidate a month's pay. Take my money! Please! Every dish I scrub is another penny just for you! As for Yucca Mountain, you won't see me moving near there any time soon. I suggest you don't either. Support our troops, not by ending the war but by rooting for the home team and letting our military do what it's trained to do. The victors do not determine when a war ends, the vanquished do - by laying down their arms and giving up the fight. Aside from having a pro-American attitude, another way to help is to donate to one of the myriad of charities set up to help soldiers and veterans in many ways. Here is a link from a DoD site with links to some of these charities that help wounded troops: [Link]. Update: Lo and behold, Google did a special logo for Veteran's Day. There's a first time for everything! I sent a tip to Newsbusters.org and within 40 minutes Noel Sheppard had emailed me back and had a post up.